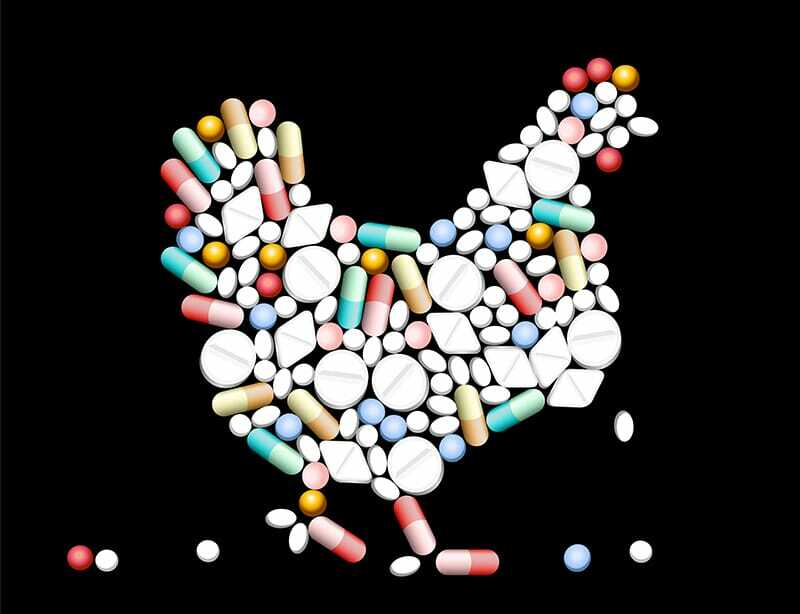 The use of antibiotics as growth promoters in poultry production is a global human health concern due to increasing resistance by pathogens to these drugs. This study from M-L. Gaucher and colleagues, published in the journal Poultry Science, set out to determine the effects on broilers of an alternative drug-free production system. The use of antibiotics in feed has helped producers using them to rapidly expand the poultry industry, whilst maintaining gut health in productive broiler breeds. However, such use places strong selective pressure on microbes to develop resistant strains, along with excessive use of these drugs in humans, pollution during production, and use in other animal production. For these reasons, the EU banned the use of antibiotic growth promoters in feed in 2006, but other countries around the world are still catching up with them. There is increasing pressure on producers from scientists and consumers as well as government, to do more to prevent the development of resistant pathogens. In European countries, the use of anticoccidial drugs is still permitted in feed to prevent coccidiosis, a major predisposing factor for the occurrence of necrotic enteritis, but in other countries the drug-free regulations are not always so lenient. Potential alternatives to drugs would be helpful to maintain broiler performance at the levels seen under antibiotic growth promoters whilst removing concerns over resistance. It would also be useful to have alternatives to prevent chickens becoming infected with zoonotic pathogens important to human health, such as Camplyobacter jejuni. This study aimed to compare alternative products with traditional antibiotic growth promoter use in commercial flocks on eight poultry farms. On each farm, the comparison was made between two similar barns, one with and one without the use of drugs. Feed, chicks, water supply, waste management and other production methods were similar between the barns. The drug-free production programme involved not adding any antimicrobial or anticoccidial drugs to feed, but broiler chicks did have an anticoccidial vaccine. Three different commercially available essential oil-based products were added to the diets of the chickens as a replacement for the antibiotic growth promoters. Various statistics were collected about the birds, such as faeces composition, gut lesion scores, necrotic enteritis incidence and Campylobacter presence, among others. The drug-free production method did not have a significant impact on the livability (survival expectancy) of the chickens, but it did significantly decrease the mean live weight of the birds at the time of slaughter by 0.05 kg, as well as increasing the feed conversion ratio. The flocks on the drug-free programme suffered from greater incidence of necrotic enteritis compared with the flocks fed antibiotic growth promoters, which displayed no enteritis-related signs. The greater incidence of necrotic enteritis is also thought to have led to increased moisture content of litter, due to altered digestive function, which was a problem because wet litter is thought to hold increased pathogen load. The drug-free broilers were rapidly treated with essential oil-based products when outbreaks of necrotic enteritis took place, which may have contributed to maintaining similar mortality levels to the conventional flocks. However, the study authors observed that the alternative products were not as effective or economical at treating the illness as antibiotics. The drug-free programme had no effect on the incidence of gut lesions in the broilers, or on the prevalence of Campylobacter jejuni. On the other hand, the drug-free barns gave rise to a higher Clostridium perfringens isolation rate. The present study had reduced rates of performance loss in the birds than those shown in previous European studies, a fact perhaps accounted for by the use of anticoccidial drugs in European production, or potentially by the use of the anticoccidial vaccine. However, it was not possible to assess how each aspect of the drug-free programme, such as the essential oils, contributed to maintaining drug-free broilers at a performance level only a few per cent below the conventional chickens. The study authors concluded that whilst their results showed it was possible to raise drug-free broilers within the Canadian production system, serious problems were caused by necrotic enteritis. They suggested that further research could look at barn conditions and how this associated with the diversity of the causative Clostridium perfringens organism.